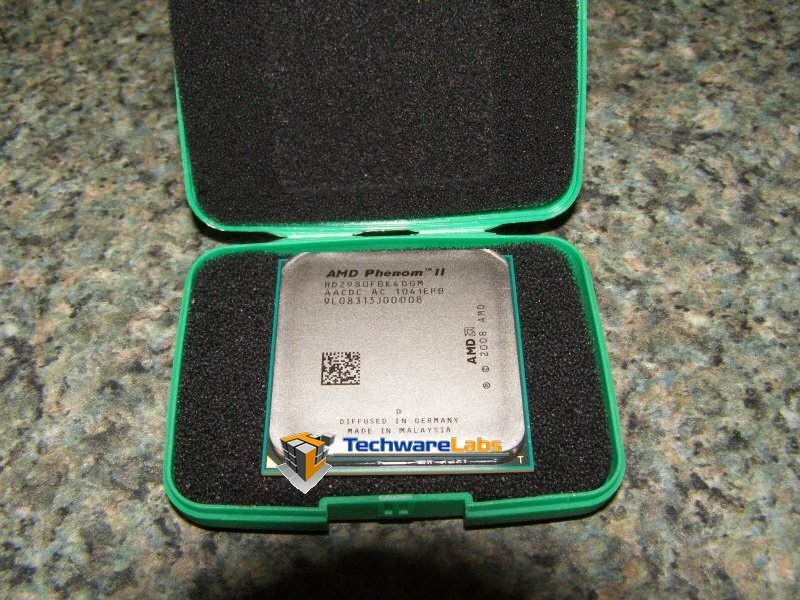 AMD has once again come up with another bump in MHz from their last processor, The Phenom II 975 with the new AMD Phenom II X4 980 Black Edition and we have one hot off the assembly line for testing. The processor speed listed by the manufacturer is 3.7GHz, but when we installed it in our test rig we were getting 4.01GHz off the bat. We updated the BIOS to the latest revision and the processor speed held at 4.01. We ran our benchmarks at this stock (all settings to auto) and all benchmarks came back as stable with results that were pretty good. Aside from the speed bump consumers can probably look forward to small refinements in the stepping which will yield identical or greater speeds with the same power envelope meaning overall lower temperatures. Those in the market for an upgrade would do well to take note as the release of the 980 will definitely have a trickle down effect on the pricing of the 975 and lower processors. This makes these perfect buys for someone seeking to get a bit more power without spending a fortune. At the time of this writing the 980 is expected to be fully available in the market with a retail pricetag of just under $200 at $195. For a sub $200 processor which easily breaks the 4K GHz barrier this is an awesome deal. Check out the full retail pricing on AMD CPU’s here. This speed bump is of course just that a speed bump as AMD fans the world over are waiting patiently for Llano which will sport a new packaging and probably pin out as well. Those who already own an AM3 platform looking to spend some cash for an upgrade should consider the 980. If however you are looking for the next level of power and can wait then Llano is just around the corner and you should save your cash. So lets see what this new processor is capable of. Wow JUST a speed bump .. and yet it goes approx 1000x as fast as previous proc. You guys are sure hard to please. Quote “which easily breaks the 4k ghz barrier” .. looks like they found the secret sauce for their procs. OMG.